Way back in December of 2014, when my husband was still just my boyfriend, we attended a university holiday party with a friend. The party had it all --food, drinks, ice skating, and an open-air photo booth. It had been years since my last photo booth experience --probably paying $5 to squish with friends into the little booth enclosure at the zoo or arcade as kids. The open-air concept seemed genius to us and we happily jumped in (no squishing necessary) for a few photos. A few months later, Austin couldn't seem to get the memory of that booth experience out of his head. He was interested in small business ownership and loves when creativity meets community, plus making a few extra dollars to put towards student loans would be nice. He began thinking about ideas for building his own open-air booth. As much as he desires to be handy and make things himself, he soon realized the limits of trying to build something in the 9x9 foot bedroom he rented in a shared apartment in the city. After researching his options, he decided to purchase a booth. 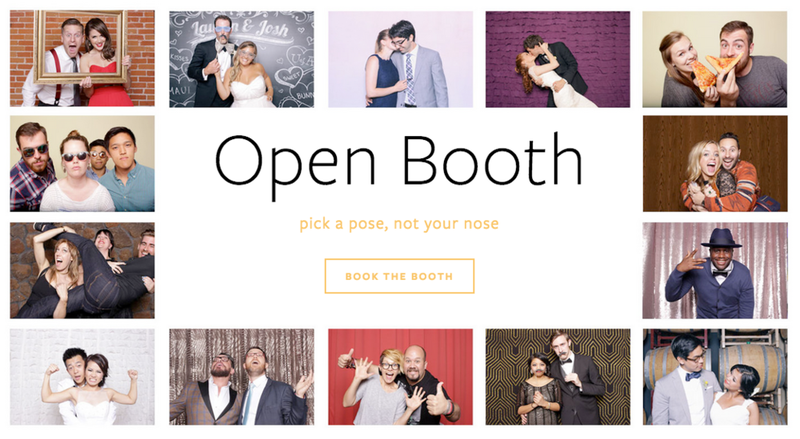 He already had a DSLR camera that would work perfectly, so in late summer he ordered a basic photo booth from Photo Booth Supply Co. and acquired the necessary printer, media, and backdrop materials from other vendors online. Luckily, he had just moved into a huge house with friends and had plenty of storage space for all the new gear. As you may have noticed, I wasn't super involved with the researching and purchasing of the booth (I'm not so tech-savvy), but once it arrived, I was on board to help with everything. We got on Squarespace and started designing our first website (which has since been greatly improved), researched what others were doing in our area, reached out to potential clients, and spent hours taking test photos with friends (who we now call our executive board). And on October 1st, 2015 Open Booth officially launched. It's been a great adventure so far and we're excited to continue sharing it with you!